Invasive plants disrupt ecosystems from local to landscape scales. 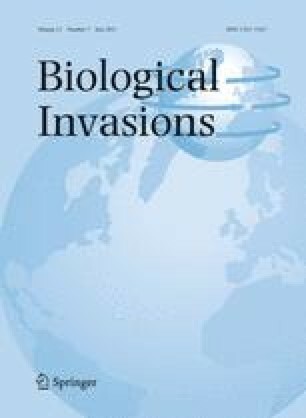 Reduction or reversal of spread is an important goal of many invasive plant management strategies, but few general guidelines exist on how to achieve this aim. We identified the main drivers of spread, and thus potential targets for management, using a spatially explicit simulation model tested on different life history categories in different spread and landscape scenarios. We used boosted regression trees to determine the parameters that most affected spread. Additionally, we analysed how spread reacted to changes in those parameters over a broad realistic range. From our results we deduce four simple management guidelines: (1) Manage dispersal if possible, as mean dispersal distance was an important driver of spread for all life history categories; (2) short bursts of rapid spread or more usual year on year spread can have different drivers, therefore managers need to decide what type of spread they want to slow; (3) efforts to manage spread will have variable outcomes due to interactions between, and non-linear responses to, key drivers of spread; and (4) the most useful demographic rates to target depend on dispersal ability, life history and how spread is measured. Fecundity was found to be important for driving spread only when reduced to low levels and particularly when the species was short lived. For longer lived species management should target survival, or age of maturity, especially when dispersal ability is limited. The online version of this article (doi: 10.1007/s10530-010-9922-5) contains supplementary material, which is available to authorized users. This work was funded by the Condamine Alliance, Queensland Murray-Darling Committee, the Co-operative Research Centre for Australian Weed Management and the Australian Research Council (LP0667489). YMB is supported through an Australian Research Council Australian Research Fellowship (DP0771387). Thanks to Ric Colasanti for initial modelling ideas and discussion.